Media Relations posted an update in AMEX EXPLORATION INC.
8020 Admin posted a press release Amex Expands High Grade Zone on Strike and to Depth at Perron With 11.05 g/t Au Over 10.3 m Including 99.2 g/t Au Over 0.5 m and 77.61 g/t Au Over 0.6 m in Amex Exploration Inc.
MONTREAL, March 26, 2019 (GLOBE NEWSWIRE) -- Amex Exploration Inc. (“Amex or the Company”) (AMX: TSX-V; FRA: MX0) is very pleased to announce that ongoing drilling of the Eastern Gold Zone (“EGZ”) at the Perron project (“Perron”) continues to intersect high grade gold mineralization in additional step out drillholes. Drill hole PE-19-36 intersected 11.05 g/t Au over 10.3 m including 99.2 g/t Au over 0.5 m, 18.3 g/t Au over 0.5 m, and 77.61 g/t Au over 0.6 m on the Company’s furthest east 25 metre step-out hole testing the High Grade Zone (“HGZ”). The intersected mineralization, which is characteristic of the HGZ, consists of two gold-bearing quartz veins located on either side of a narrow weakly mineralized mafic intrusive crosscutting a large unit of silicified rhyolite. These two quartz veins typically contain sphalerite, pyrite, and visible gold as coarse grains, flakes, or specs. Additional gold-bearing intersections are detailed in Table 1 and shown in Figures 1 and 2. Logan Richard has joined Amex Exploration Inc.
8020 Admin posted a press release Amex Intersects 248.05 g/t Au Over 0.80 m in PE-19-33 and 156.83 g/t Au Over 0.65 m in PE-19-31 at Perron in Amex Exploration Inc.
8020 Admin posted a press release Amex Launches 10,000m Drill Program at Eastern Gold Zone and Creates Drill Data Room on Website in Amex Exploration Inc.
MONTREAL, March 05, 2019 (GLOBE NEWSWIRE) -- Amex Exploration Inc. (“Amex or the Company”) (AMX: TSX-V; FRA: MX0) is very pleased to announce the launch of a significantly expanded drilling program on the Eastern Gold Zone (“EGZ”) at the Perron project (“Perron”). The expanded exploration program will involve approximately 10,000 metres of drilling, testing the depth and lateral extensions of the High Grade Zone ("HGZ") of the EGZ. In addition to the HGZ, the Company will also continue to test the geometry and nature of the parallel Low Grade Zones (“LG1” and “LG2”) as a second priority. This drill program follows the completion of a very successful 3,000 metre drill program, which intersected the High Grade Zone over a vertical distance of approximately 150 metres and a lateral distance of 50 metres pierce point to pierce point with a spacing varying from 25 to 50 metres. The High Grade Zone extends to a depth of approximately 275 metres below surface and remains open towards surface, to depth, and along strike. In addition, the Company wishes to announce that it has intersected additional visible gold during its ongoing drill program. In addition, as part of Amex’s commitment to maximum transparency and in keeping with industry best practices, Amex is delighted to provide its drilling data on the Company’s website at http://www.amexexploration.com/perron/drill-data-room/. The data will include drill coordinates, downhole surveys and assay composites for all drilling completed on the EGZ. The Company will regularly update the data as the current drill program progresses. The EGZ was discovered in December of 2017 during a regional exploration drilling campaign. The discovery hole, PE-17-03, identified two zones of near-surface mineralization, called the High Grade Zone and the Low Grade Zone, which returned values including 12.22 g/t Au over 4.66 metres and 0.81 g/t Au over 76.5 metres, respectively. Follow-up drilling in 2018 in drill hole PE2018-17 intersected values including 269.23 g/t Au over 1.35 metres and 0.74 g/t Au over 20.75 in the High Grade Zone and Low Grade Zone, respectively. Following this, an aggressive exploration program targeting the High Grade Zone has begun, from which assays have returned grades including 393.33 g/t over 1.7 metres in PE-19-22, 39.58 g/t Au over 0.75 metres in PE-19-23, 214.71 g/t Au over 0.65 metres in PE-19-24, and 56.75 g/t Au over 8.5 metres in PE-19-27. 8020 Admin posted a press release Diangrams to News Release February 27, 2019 - Amex Intersects 581.59 g/t Gold Over 0.80 Metre in First Step Out Drilling Expanding the High Grade Zone at Perron in Amex Exploration Inc.
8020 Admin posted a press release Amex Intersects 581.59 g/t Gold Over 0.80 Metre in First Step Out Drilling Expanding the High Grade Zone at Perron in Amex Exploration Inc.
8020 Admin posted a press release Amex Exploration Inc reaches new 52-Week High in Amex Exploration Inc.
Shares of Amex Exploration Inc (TSXV:AMX) hit a new 52-Week High today, currently trading at $1.49 on volume of 138,572 shares. In the past 52 weeks, Amex Exploration Inc has traded between a low of $0.055 and a high of $1.48 and is now trading 2609% above that low. Amex Exploration Inc shares have a 50-day moving average of $0.4716 and a 200-day moving average of $0.1742. About Amex Exploration Inc: Amex Exploration Inc is a junior mining exploration company which focuses on developing viable gold and base metals deposits in mining-friendly jurisdictions. 8020 Admin posted a press release Amex Grants Stock Options in Amex Exploration Inc.
8020 Admin posted a press release Amex Completes $5.4 Million Private Placement and Welcomes Eric Sprott as Strategic Investor in Amex Exploration Inc.
MONTREAL, Feb. 21, 2019 (GLOBE NEWSWIRE) -- Amex Exploration Inc. (“Amex” or the “Company”) (AMX: TSX-V; FRA: MX0) announces the completion of the previously announced non-brokered private placement, in the amount of $5,442,875. In connection with the offering (the “Offering”) 7,256,000 units, each priced at $0.75 (the “Units”) were issued, with each Unit consisting of one common share and one half (½) of one common share purchase warrant (the “Warrant”) having an exercise price of $1.25 and a term of 18 months provided that, the Company may issue a notice of acceleration to the Warrant holders if the volume weighted average price of the common shares is greater or equal to, $1.50 for 20 consecutive trading days in which case the Warrants will expire 30 days later. Mr. Eric Sprott, through 2176423 Ontario Ltd., a corporation which is beneficially owned by him, acquired 4,000,000 Units under the Offering for a total consideration of $3,000,000. Following the completion of the private placement, Mr Sprott’s holdings represent 7.40% of the issued and outstanding common shares of the Company, on a non-diluted basis, and 10.71% on a partially diluted basis, assuming the exercise of the Warrants acquired hereunder and forming part of the Units. Mr. Sprott did not beneficially own any securities in the Company prior to this investment. The Units were acquired by Mr. Sprott for investment purposes and with a long-term view of the investment. Mr. Sprott may acquire additional securities of the Company either on the open market or through private acquisitions or sell securities of the Company either on the open market or through private dispositions in the future, depending on market conditions, reformulation of plans and/or other relevant factors. A copy of 2176423 Ontario Ltd.’s early warning report will appear on the Company's profile on SEDAR and may also be obtained by calling (416) 362-7172 (200 Bay Street, Suite 2600, Royal Bank Plaza, South Tower, Toronto, Ontario M5J 2J2). Three directors of Amex, Victor Cantore, Pierre Carrier and André Shareck, have participated in the private placement for the aggregate amount of $210,000. Pursuant to Policy 5.9 of the TSXV and Regulation 61-101 Respecting protection of minority security holders in special transactions (“Regulation 61-101”), each of these transactions constitute a “related party transaction” and as such, minority shareholder approval and a formal valuation may be required. However, such transactions meet the exemptions set out in Regulation 61-101 as the fair market value of the consideration for the transactions, as they involve related parties, does not exceed 25% of Amex’s market capitalization, as per Sections 5.5(a) and 5.7(a) of Regulation 61-101. A material change report in respect of this transaction will be filed however, the Corporation could not do so 21 days prior to the anticipated closing as their intent to participate was not determined at such time. In connection with the private placement, Amex paid finder’s fee to several eligible intermediaries, including Generic Capital Corporation and Stephen Avenue Securities, in the aggregate amount of: $19,125 paid in cash; 307,440 Units in lieu of cash; and 332,000 non transferable broker warrants, having the terms and conditions of the Warrants issued under the Offering. All securities issued pursuant to the private placement are subject to a 4-month and one day hold period and the transaction remains subject to the receipt of all necessary regulatory approvals, including the final approval of the TSX Venture Exchange. Shares of Amex Exploration Inc (TSXV:AMX) hit a new 52-Week High today, currently trading at $0.97 on volume of 63,015 shares. In the past 52 weeks, Amex Exploration Inc has traded between a low of $0.055 and a high of $0.95 and is now trading 1664% above that low. Amex Exploration Inc shares have a 50-day moving average of $0.3594 and a 200-day moving average of $0.1447. Shares of Amex Exploration Inc (TSXV:AMX) hit a new 52-Week High today, currently trading at $0.90 on volume of 12,000 shares. In the past 52 weeks, Amex Exploration Inc has traded between a low of $0.055 and a high of $0.83 and is now trading 1536% above that low. Amex Exploration Inc shares have a 50-day moving average of $0.3419 and a 200-day moving average of $0.1402. Victor Cantore has joined Amex Exploration Inc.
8020 Admin posted a press release Amex Announces $5 Million Private Placement in Amex Exploration Inc.
MONTREAL, Feb. 13, 2019 (GLOBE NEWSWIRE) -- Amex Exploration Inc. (“Amex” or the “Company”) (AMX: TSX-V; FRA: MX0) announces that it has undertaken to complete a non-brokered private placement in the maximum amount of $5,025,000, through the offering of up to 6,700,000 units priced at $0.75 each. Each unit will consist of one common share and one half of a common share purchase warrant (the “Warrant”) having an exercise price of $1.25 and a term of 18 months. The Warrants are subject to an accelerated expiry if the volume weighted average price of the common shares is greater than or equal to $1.50 for any 20 consecutive trading days and, if the Company has given notice. The Warrants will expire 30 days following the date of such notice. 8020 Admin posted a press release Amex Announces Appointment of Kelly Malcolm as Vice President Exploration and Provides Exploration Update in Amex Exploration Inc.
Darren Stewart has joined Amex Exploration Inc.
8020 Admin posted a press release Amex Continues to Intersect High Grade Gold at the Eastern Gold Zone With 214.71 g/t Au Over 0.65 M in Hole PE2019-24 in Amex Exploration Inc.
8020 Admin posted a press release First Hole in Amex 2019 Drill Program Returns 393.33 g/t Au Over 1.70 m at Perron Eastern Gold Zone in Amex Exploration Inc.
8020 Admin posted a press release Amex Hits 269.2 g/t Au Over 1.35 Meters in Drill Hole PE2018-17 on the Eastern Gold Zone at Perron in Amex Exploration Inc.
MONTREAL, Dec. 13, 2018 (GLOBE NEWSWIRE) -- Amex Exploration Inc. (“Amex or the Company”) (AMX: TSX-V; FRA: MX0) is very pleased to announce that it has intersected a high grade gold bearing quartz vein containing multiple free coarse gold grains that returned a value of 269.23 g/t Au over 1.35 meters (from 241.85m to 243.2 m in hole PE2018-17; ie Target 2018-X3: please refer to Fig.1) at the Eastern Gold Zone (EGZ). 8020 Admin posted a press release Amex Reports 5 High Grade Gold Intersects Within a 100 Meter Long Interval in First Follow Up Drill Hole on the Eastern Gold Zone at Perron in Amex Exploration Inc.
8020 Admin posted a press release Amex Raises Proceeds of $552,000 in Amex Exploration Inc.
MONTREAL, Dec. 03, 2018 (GLOBE NEWSWIRE) -- Amex Exploration Inc. (TSXV: AMX) (“Amex” or the “Corporation”) is pleased to announce the completion of the previously announced non-brokered private placement (the initial amount of $500,000 was increased to $552,000, following an over subscription) pursuant to which, 6,900,000 units, priced at $0.08 each, were issued. Each unit consists of one common share and one common share purchase warrant having an exercise price of $0.15 and a term of 18 months. Four directors and insiders of Amex have participated in the private placement for the aggregate amount of $78,000. Pursuant to Policy 5.9 of the TSXV and Regulation 61-101 Respecting protection of minority security holders in special transactions ("Rule 61-101"), each of these transactions constitutes a "related party transaction". However, the Corporation is exempt from obtaining minority shareholder approval and an independent evaluation, as per Sections 5.5(a) and 5.7(a) of Rule 61-101. In connection with the private placement, Amex has paid finder’s fee to unrelated registered dealers, in the total amount of $8,400, representing a commission equal to 7% of the gross proceeds raised through their efforts. 8020 Admin posted a press release Amex Undertakes Private Placement in Amex Exploration Inc.
8020 Admin posted a press release Amex First Results on its New Drilling Program at Perron: Multiples Gold Structures Intersected in Amex Exploration Inc.
8020 Admin posted a press release Amex Starts Follow-Up Drilling on the Eastern Gold Zone at Perron in Amex Exploration Inc.
MONTREAL, Oct. 15, 2018 (GLOBE NEWSWIRE) -- Amex Exploration Inc. (“Amex or the Company”) (AMX: TSX-V) announces the commencement of its drill program on the newly discovered Eastern Gold Zone (EGZ) (see PR2018-03-02). The program incorporates results of the integration and interpretation of the recent 'orevision' ground geophysical survey executed by Abitibi Geophysics (see PR2018-08-05). The new drilling program consist of 18 diamond drill holes (DDH) totalling 6,171 meters that is designed to primarily test the lateral and depth extensions of the known EGZ. In addition, the program will test the continuity between the mineralized intersections of previous drill holes that intersected the EGZ (i.e. infill drilling). The planned intersection spacing, if successful, should enable us to establish a first estimate of a potential resource calculation of this Zone. In order to achieve these objectives, the drilling program has been planned in order of priority. Therefore, priority 1 holes, 9 holes totalling a planned 2,617 meters drill program, will focus on the immediate vicinity of hole PE-2017-03 where values of up to 7.89 g/t Au over 7.5 meters have been intersected (see PR2018-03-02). This Phase 1 of drilling will start before the end of October 2018. Priority 2 holes consist of 5 holes totalling 1,485 meters of drilling. The main objective is to verify the Eastern lateral potential extension of the EGZ. Finally, Priority 3 holes will test the extension at depths of more than about 300 meters. For this objective, 4 holes are planned for a total of 2,069 meters of drilling. "This very promising follow-up drilling campaign on the EGZ of the Amex 100% owned Perron Property will be of the utmost importance for the future development of this property as well as for the Company. 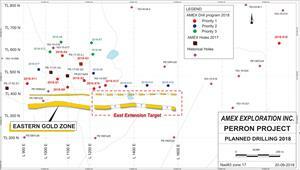 Our previous drilling on the EGZ target was a complete success and I am very confident about our ability to deliver results given the amount of data and planning that has gone into this drill program," said Jacques Trottier, PhD Amex's Executive Chairman. Stéphane Faure, Geo, PhD of InnovExplo, a Qualified Person as defined by Canadian NI 43-101, designed the current drilling program and approved the geological information reported in this news release. 8020 Admin posted a press release Ground Geophysics Identifies Drill Targets at Perron Eastern Gold Zone in Amex Exploration Inc.
MONTREAL, Sept. 05, 2018 (GLOBE NEWSWIRE) -- Amex Exploration Inc. (TSXV: AMX) (“Amex” or the “Corporation”) is pleased to announce that an IP geophysical ground survey has just been completed at the 100% owned Perron Property located in Abitibi, Quebec. This survey covers approximately 2 km2 of the recently identified Eastern Gold Zone (See PR-2018-03-01) using a 100 to 200 meter spacing grid totalling 16.3 km of cut lines (see fig.1). The survey was done by Abitibi Geophysique Inc. using their proprietary technology "OreVisionIP". Results of this survey will be integrated into the 3D model that Innovexplo and Amex has created for the next drilling targets at the Eastern Gold Zone as well as its potential lateral extensions and other similar gold bearing structures. A follow-up drill program is being prepared with the support of the updated 3D model that should help to better define the geometric and genetic relationship of this new Eastern Gold Zone. Media Relations has joined Amex Exploration Inc.